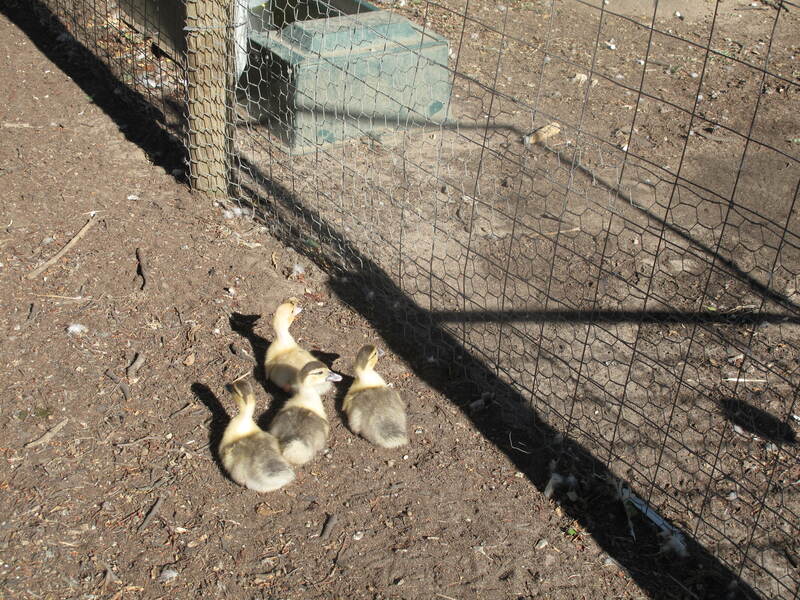 Yesterday afternoon, the four new ducklings settled into their pen, then got straight out again! 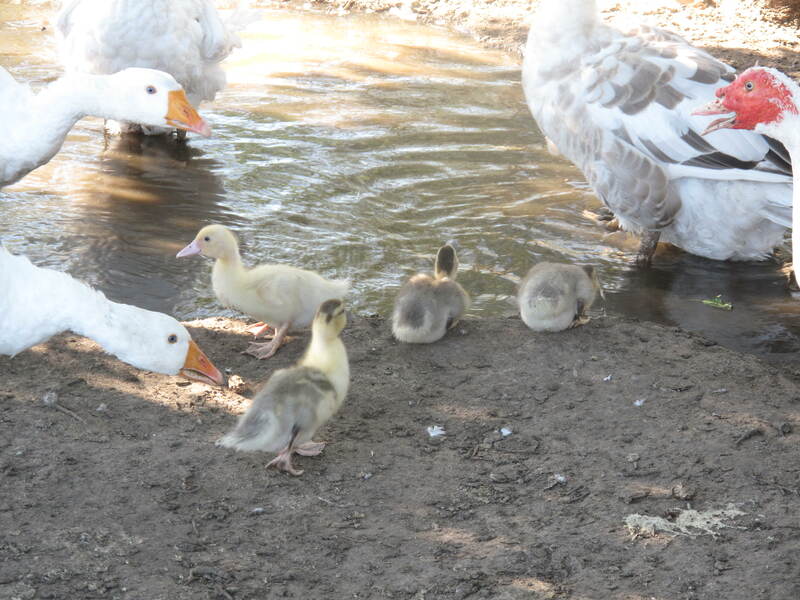 The gang welcomed the ducklings with a chorus of gleeful honking, then quieter little sighing sounds. Predictably, Godfrey, the head gander, hissed at me threateningly. He has very strong paternal instincts! 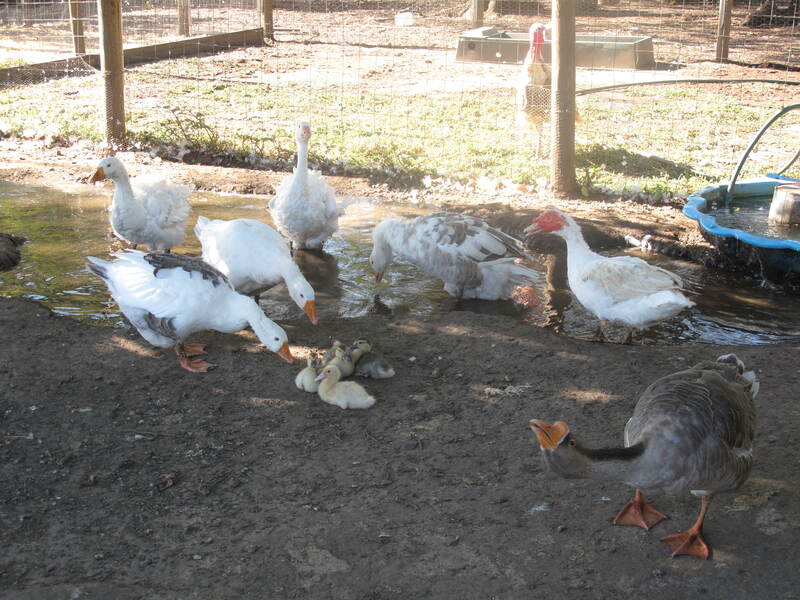 But the happiest of the gang was Zaruma, our only remaining duck. His mate, Tapper (the one who used to actually scale the yard fence and get out), was killed by a fox last year, so he has been very lonely. His joy was amazing; he can’t quack for some reason but he was madly wagging his tail. He’s the one on the right with the red face. 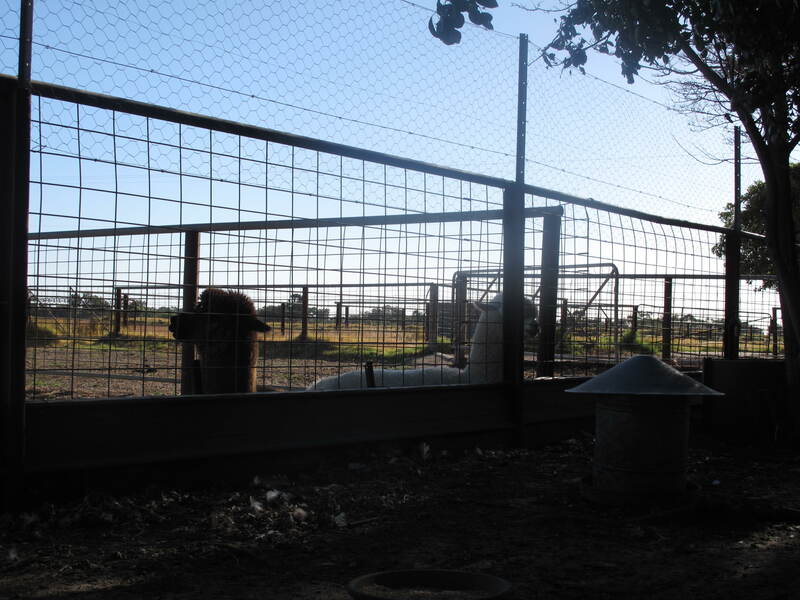 The alpacas, Uluru and Okami, settled protectively on the other side of the fence. 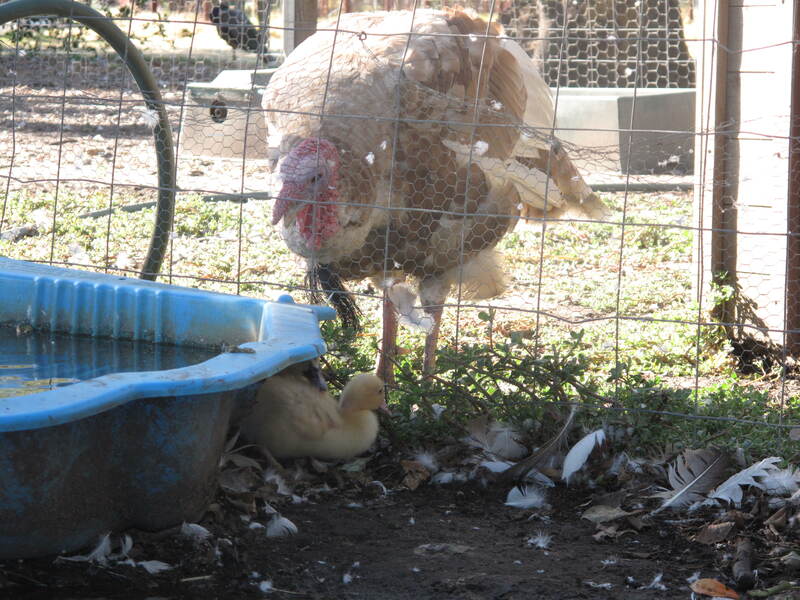 Even Baby Turkey became interested in a pecking sort of way. Woodroffe and Diamond exchanged raised eyebrows. 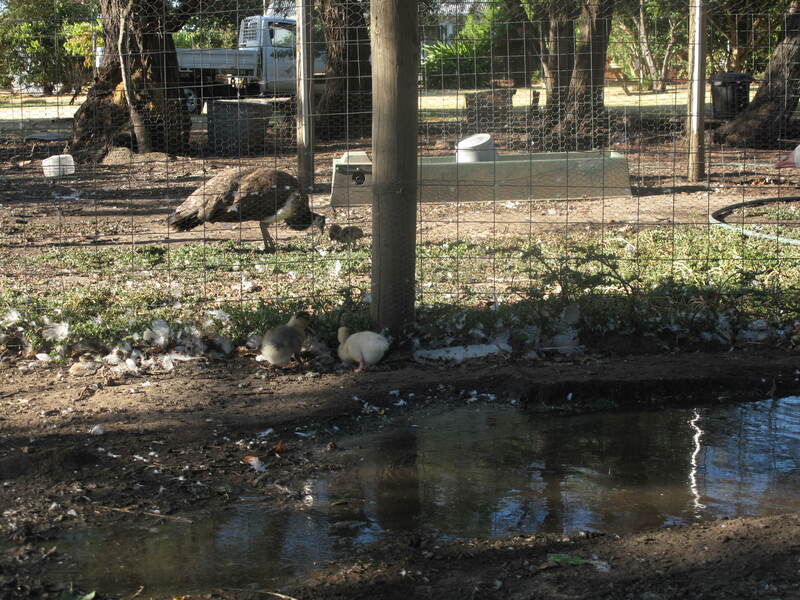 The ducklings were very curious about the peachicks. 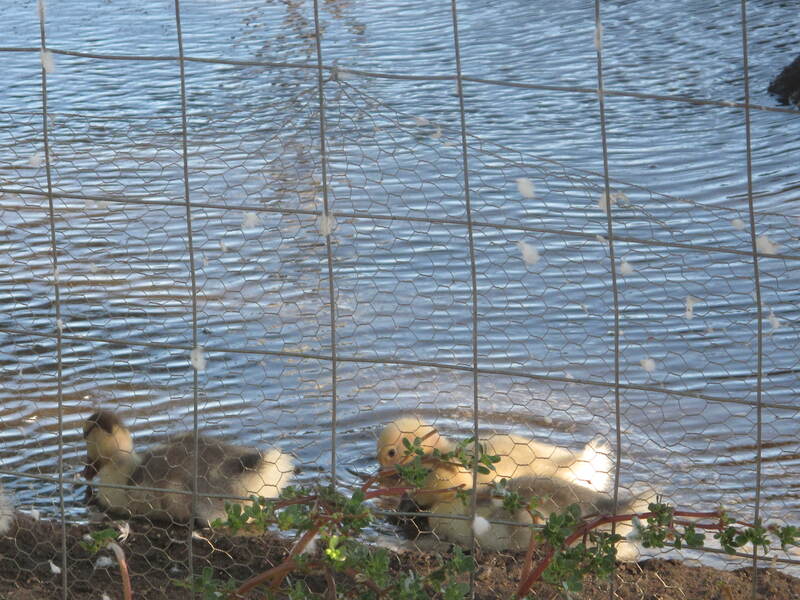 But they were much more interested in their first swimming lesson. What a wonderful series of photos! It made me happy to look at them – and not just the little ones,but all my “friends”, especially that fancy Woodruffe! Thanks so much for sharing. They’re great! I just hope they survive! I concur these are great photographs. I love the expressions captured. 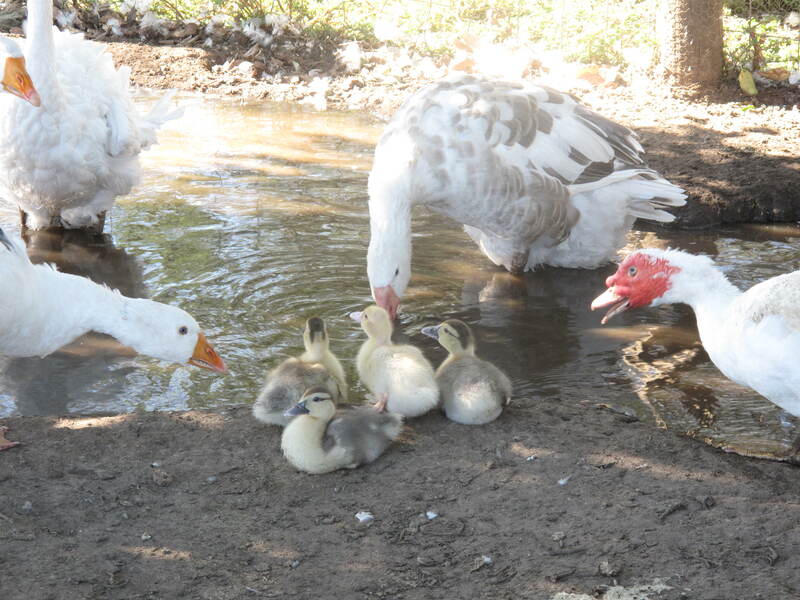 Amazing how the ducklings are welcomed by the other species. And they are so cute. Good work! Haha – I just commented on your post! 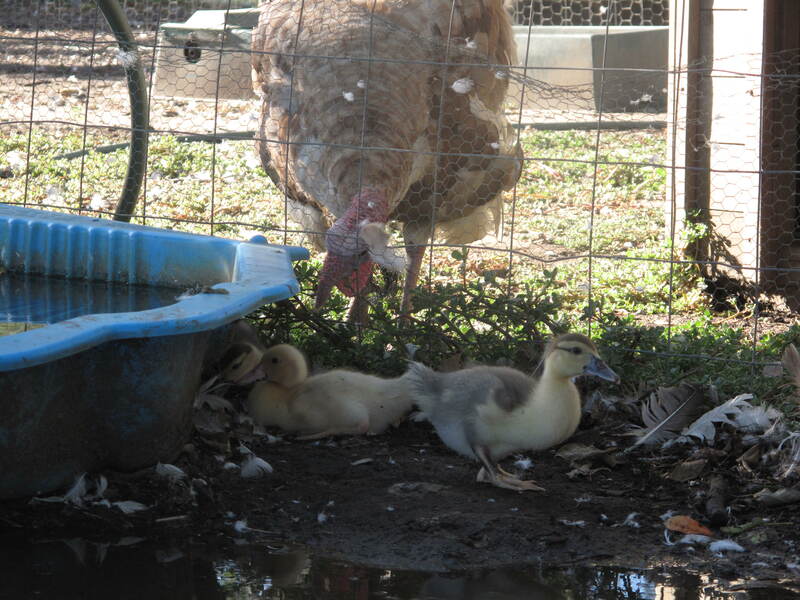 Yes, I was worried they’d be pecked but instead they are loved by the others! I love these pictures! 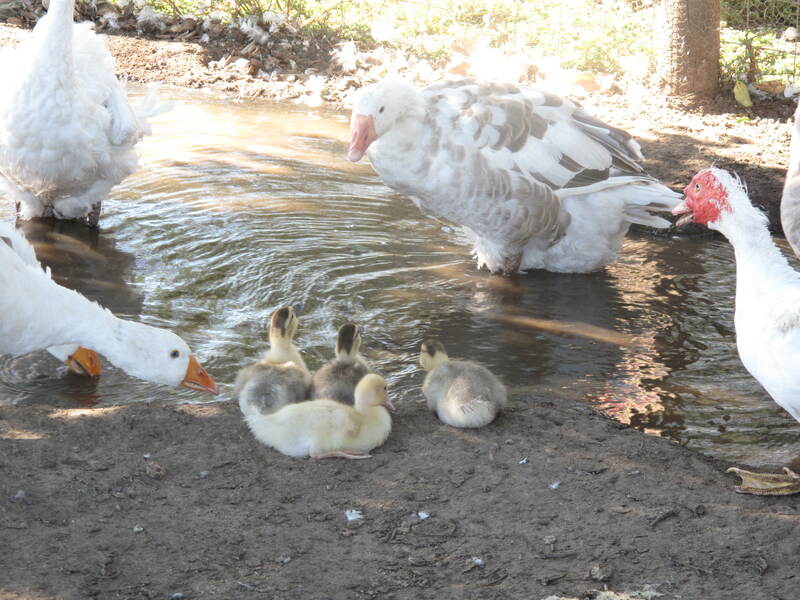 What a wonderful family of feathered friends.! Even the peacocks are cawing to keep crows away! I am leaving it to Godfrey because I have learned the hard way that human interference is not a good idea (except for G9 who was abandoned). I love hearing about your birds! I love talking about them! You have a lot of birds! I know you do! Who is the biggest bird lover, or who did it first? You or Ants? It’s so delightful! Just hope they survive. crossing fingers and toes for you…hope so too. Isn’t it amazing how all the rest of the Gang welcomed them. I do so hope they survive and the others protect them. Me too – they keep squeezing out of the yard! How wonderful! after the sadness of people passing in your life and mine, it is a joy to see new life. They sure are intriguing the others in the yard! Thanks for sharing these lovely photos. I can feel how they will bring some fun and joy into life. I’m about to go out now and check on them. 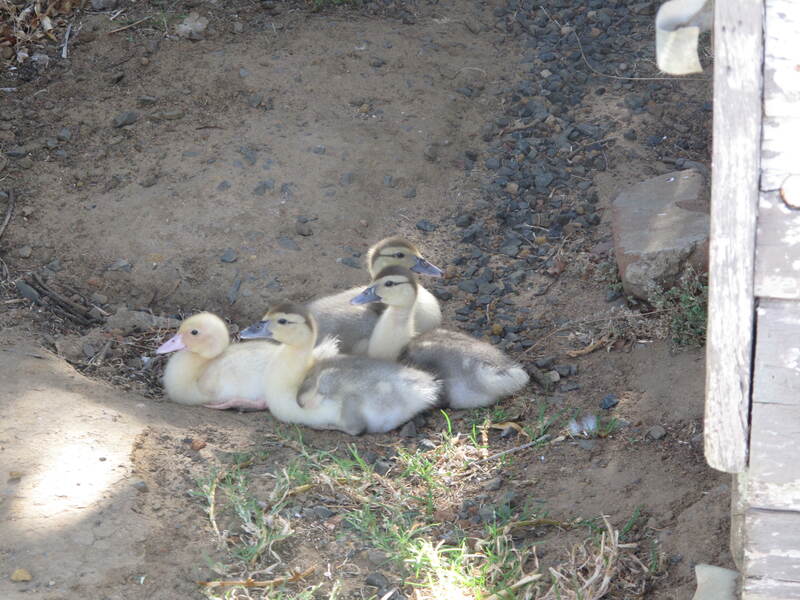 That was a very packed first day on the farm for the ducklings! Super that they were welcomed so kindly to the flock. Wonderfully caught by you. Ming asked me why I got four instead of two and I said that I wasn’t sure how many would survive – fingers crossed. I have become pragmatic. With nature red in tooth and claw, you have to be. How wonderful, Julie! I love all the photos and what wonderful names everyone has! You have such a gift for describing everyone” s reactions and what’s transpiring…have you ever thought of writing a children’s book about your farm family? I think it would be charming…. I was thinking the same thing! Thanks Lori. Need better photos or an illustrator. New life!! It is always such a thrill!!! And these little fluffy babies are adorable!! I have to not love them too much just in case they don’t survive – weird feeling. I hadn’t even thought of that!! Definitely must be a weird feeling.. Your descriptions of their reactions seem to be spot on! I laughed at the shared raised eye brows. And I was happy for Zaruma! 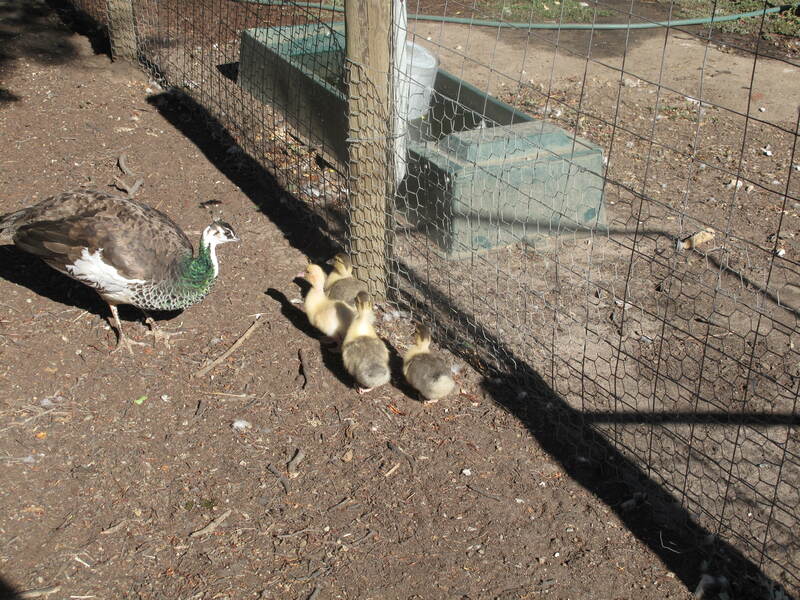 We lost all of our chooks due to foxes so I am going to get some more but keep them penned – fingers crossed. Wonderful photos. So sweet. Stay safe little ones. Please wish Anthony happy birthday for me. sorry to hear of Mingus problems. Hope it works out well. Lovely birds. The birds here are starting to sing in the morning when it is still pitch black. The nests will be built soon. 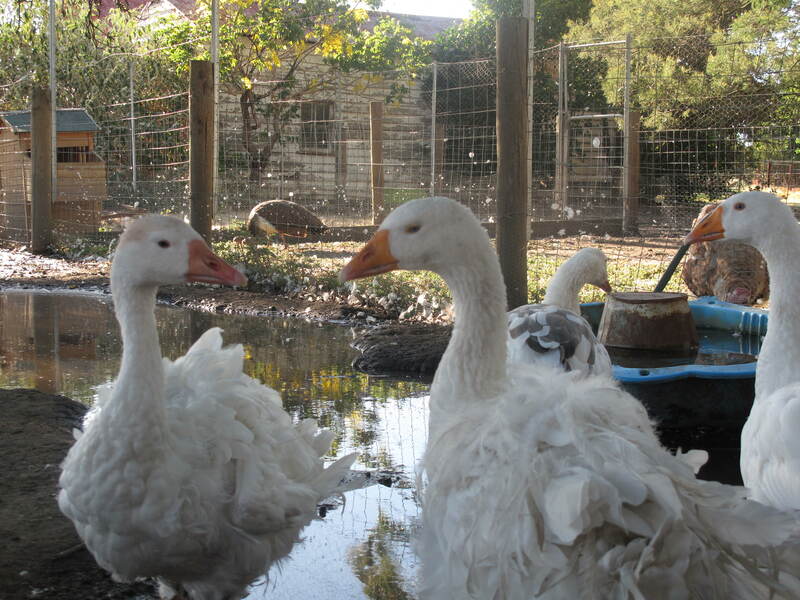 Will your birds be safe from predators? I love these pictures, Julie! I’ve missed your water fowl. 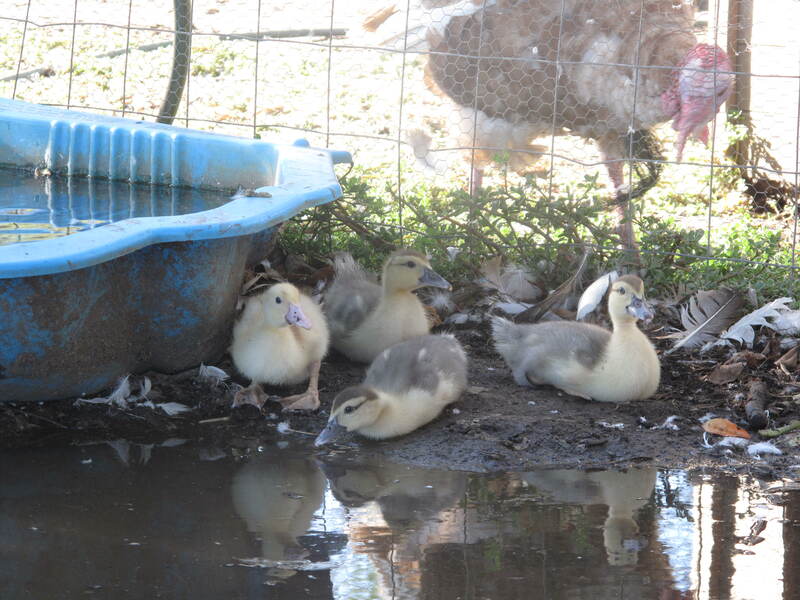 By the way, your duck is a muscovy and the males never quack. 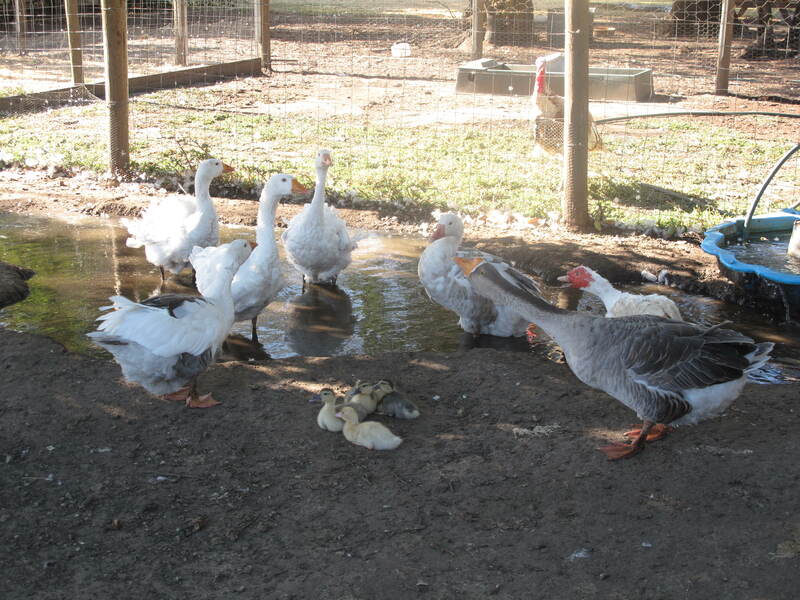 The males can hiss and the female is capable of a very low short quack. Darling! Great photos and so glad the other birds are welcoming. Wonderful, Julie … love the photo where all the different birds is paying their attention to the duckling – wonderful … that is a fantastic shot … like it’s the biggest event of the year and the ducklings are just so lovable. You have some truly wonderful birds on the farm. Thank you for sharing the bird lives with me.